Industry continuously looks for ways to improve processes, save money and decrease manufacturing and design and development cycle time. Robotics are used in many industries for various applications across the world. NASA uses robots for exploration and they require specific materials that will handle different environments. In education, students in robotics classes build robots using PLA and ABS, but the parts are too brittle and fall apart easily. Building robots require customizable parts that will be able to withstand abrasion resistance and that use lightweight materials. Robotics in education are to help students learn how to engineer under complicated situations to develop solutions. Most robotics used in industry require customization which traditionally been made with CNC. Even the doctors in medical fields use robots for very precise surgeries that can be program to prior to prevent from shaking. There is much more control with a robotic arm for certain procedures. Robots can do things that humans cannot, due to specific climates or environments, fine repeatable motions or speed and repetition. Great strides have been made in the last decade to improve what robots can do. Additive manufacturing techniques can improve the speed and efficacy with which robots are employed and decrease initial setup costs. High strength plastic and fiber reinforced materials have high strength to weight, toughness, dimensional stability, heat tolerance and abrasion and chemical resistance. These properties are desirable when printing lightweight parts for battlebots or parts for industrial robotics that require strength and lightweight. Printing parts is less expensive than ordering aluminum custom parts that might be used as robot grips in production lines or assembly lines. Additive technologies and decrease turnaround time and ensure proper fit and functionality thereby decreasing the number of prototype iterations to arrive at a final solution. It’s easier to manufacture parts in-house. 3D printing technology allows for designing parts easier, pausing to make changes and resume printing. When creating robot grips for example, in some cases specific dimensions are needed. By allowing the option to produce many unique prints at one time, ready in under a day for next day production. Weight is always a concern in robotics. Lighter parts are easier to move and can reduce inertia to increase speed and efficiency. With carbon fiber reinforced plastics allow strength to match machined aluminum with reduced weight. 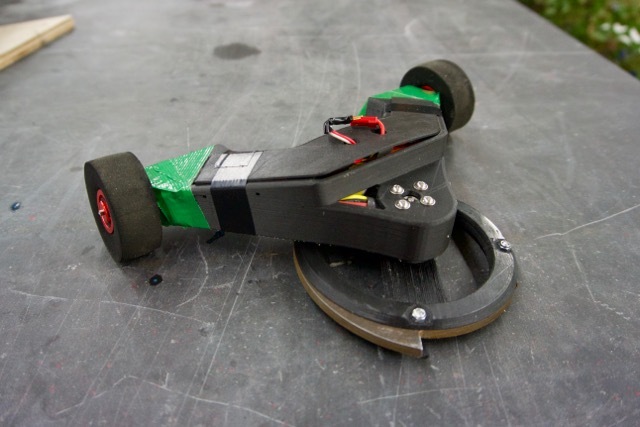 Markforged helped robot designers produce fast, durable and inexpensive small parts to enhance their robots during competitions. It’s easy to test new concepts by having a 3D printer at designers disposal. The unique quality of the Markforged Enterprise, is the ability to reinforce parts for additional strength, so robotics designers can handle multiple hits before falling apart – which can lead to winning in competitions. To check out more of this battlebots story, click here.